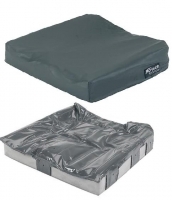 Developed alongside clinicians to address the individual postural requirements of Wheelchair Users The Matrx Flo-tech cushion uses a combination of moulded foam and dual layer fluid gel sacs which significantly increases the support surface area to provide excellent pressure - reducing properties and the highest level of skin protection for users with high risk of pressure sores. The gel re-distributes pressure away from bony prominences offering increased protection. The innovative cover design is fully waterproof and expands to enable better immersion into the cushion offering superior support, stability and comfort.